As I perused the pages of the March issue of House Beautiful, I stopped dead in my tracks when I got to the feature on Boston-based designer, Nina Farmer's stunning home. While I love every room that was featured, I ultimately decided that the master bedroom is my favorite with the kitchen and dining room coming in right behind. I love the color palette of warm mocha with pops of yellow. The room feels warm and luxurious thanks to the Philip Jeffries Manila Hemp wallcovering. It adds a great dose of color and texture to the room. The warmth of the wall covering really allows the saffron-colored velvet upholstery on the headboard of the chic, modern Room & Board bed to pop, doesn't it? 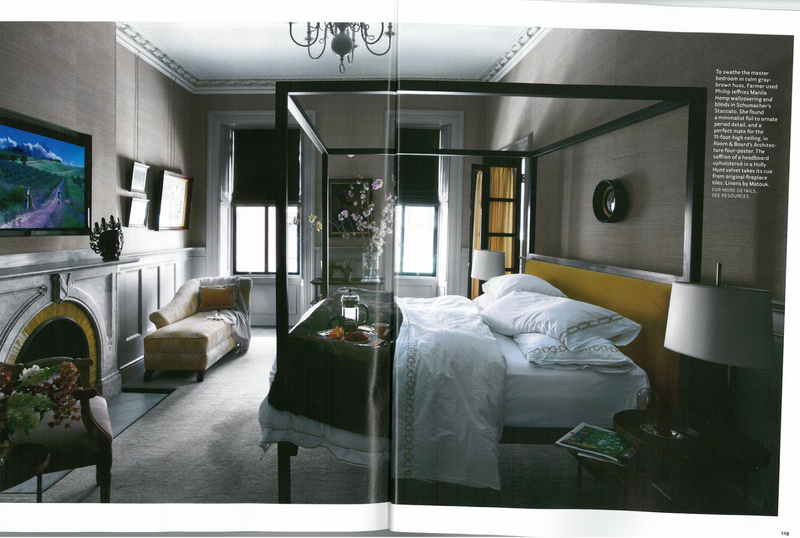 The chic Matouk bedding, yellow tile inlay on the original fireplace, and chaise further cement the chic color palette. It is such a gorgeous space! What are your thoughts? Do you like the color palette?